1. In a small bowl, mix together the soy sauce, ginger, garlic, lemon grass, lime zest and juice, sugar and chilli. 2. Pour over the beef and leave to marinate in the fridge for at least 3 hours, but ideally overnight, turning occasionally. Strain the marinade through a sieve, discard the aromatics and set aside the rest of the marinade for later. 3. Place the winter vegetables in a roasting tray, drizzle with sesame oil and season with freshly ground black pepper. 4. Preheat the oven to 220ºC, gas mark 7. Place the vegetables on the top shelf of the oven and roast for 15 minutes. 5. Place the beef in a small roasting tin and drizzle with a little of the marinade. Once the vegetables have been cooking for 15 minutes, place the beef in the oven and roast for 15 minutes. 6. Turn down the oven to 200ºC, gas mark 6. Turn the vegetables over and move to the lower shelf. Drizzle the beef with the remaining marinade and roast for 10 minutes per 500g for rare meat and 15 minutes per 500g for medium. Cover with foil if the top is browning too quickly. 7. When the beef is cooked to your liking, remove from the oven and cover loosely with foil. Leave to rest while you finish cooking the vegetables. Sprinkle the vegetables with the sesame seeds and roast for 5-10 minutes or until golden. 8. 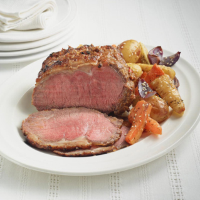 Thickly slice the beef and serve with the roasted root vegetables and a drizzle of the roasting juices over the top. This recipe was first published in February 2013.